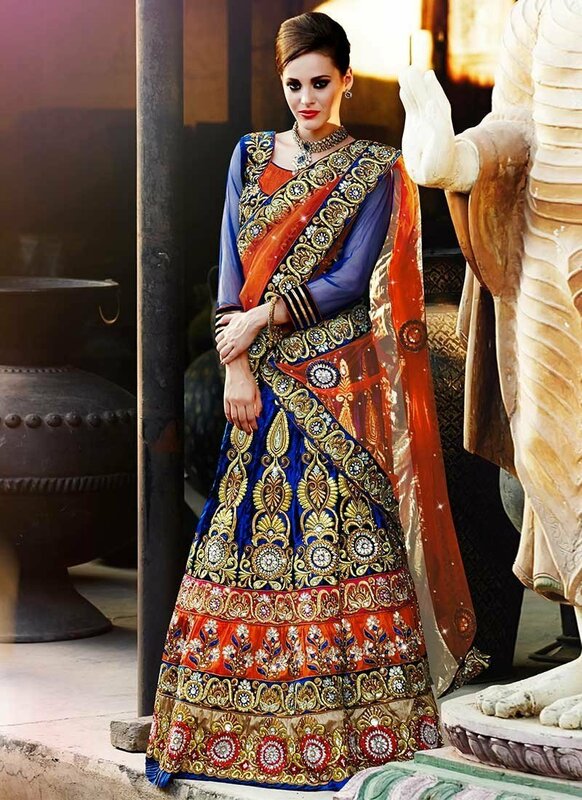 Check out these top 10 amazing dresses for Lohri Night and celebrate the festival with a cheer! We are a day away from the popular North Indian festival of winters, Lohri. The much awaited celebrations involving bonfire, food, dance and fun is literally knocking on our doors. But because the night is usually a cold one and dressing up in layers is quite important, therefore, women generally tend to worry about what to wear and what not to wear. To make your life simple and easy, Zuri has compiled a list of 10 wearable and stylish Indian dresses to flaunt on a freezing festive day. The hot picks include Pakistani suits in warm fabrics, bright silk sarees, Kashmiri salwar kameez, Indo-Western fusion wear in rich colors and textures, velvet lehengas, gowns and saree-gowns. Besides, you can also team up a nice ethnic jacket over a pair of casual jeans or leggings. A Pashmina or a semi-Pashmina shawl, stole or short/long jacket in silk, tussar-silk, Kashmiri embroidery can be used as an add-on along for the extra layering. So, you can pack yourself from head to toe with a really heavy layering and still look stylish! Know how? By being a little more creative :). Here are a few more interesting ideas of how you can dress up on Lohri. 1. Wear a long woolen dress with boots, long jumpers with woolen leggings, or traditional bright jackets paired with denim or trousers. 2. Ethnic coats and blazers are also extremely trendy this season, especially those with patch-work, Kantha embroidery and Phulkari work. 3. Go for versatile dressing and Zuri also recommends you choose richer, darker shades. They speak volumes of warmth and brighten up an otherwise dull day! Besides, dark colors are pretty festive as well. 4. If it is your first lohri after wedding, then opt for an outfit with embellishments, gold or antique Zardosi, Resham & stones work. 5. With smart-casual attire, such as long shirt and pants (in silk or any other rich fabric), opt for a bright stole or scarf. 6. With a salwar-kameez, Zuri suggests you make braid and wear hair ornaments, such as a parandi (colourful Punjabi decoration for hair). Accessorize well with long jhumkis with a band-neck, statement neck piece with deep-neckline or just a maang teeka (this one headgear is to watch out for this year) with open hair. A handmade-clutch, organza pouch bag, velvet purse or a potli with beads, embroidery or stone work can complete the overall look.